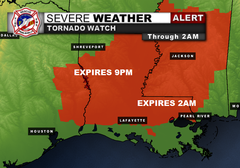 A TORNADO WATCH IS IN EFFECT FOR ST. TAMMANY PARISH THROUGH 2 AM. MONITOR THE WEATHER. MONITOR WEATHER REPORTS AND LOCAL MEDIA. PREPARE TO ACT TO PROTECT YOURSELF AND FAMILY IF A TORNADO THREATENS.